Product #16791 | SKU MME201 | 0.0 (no ratings yet) Thanks for your rating! 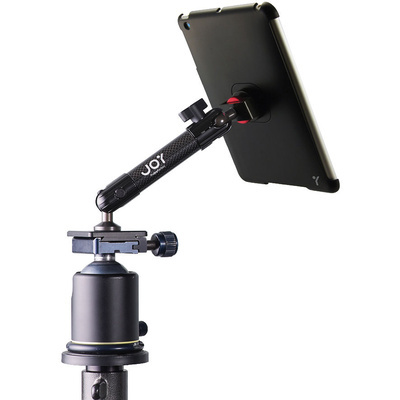 The MagConnect Tripod/Mic Stand Mount for iPad mini/iPad mini with Retina Display from The Joy Factory provides a secure way to mount your iPad mini on a standard tripod or mic stand. It uses the tools you already have to enhance your tablet experience. The stand allows you to mount a tablet on a tripod to take steady images or use with a mic stand as a sheet music replacement. This keeps your tablet at the right height and angle. It fits all standard tripods and microphone stands. With the included MagConnect iPad holder, your iPad can be swivelled 360° for easy transition from portrait to landscape mode. When the case is attached to a compatible product, another magnet instantly interlocks your MagConnect shell with a receiver, while a precision screw tightens for a secure fit. MagConnect mounts are built of carbon fibre arms. This material is lightweight yet strong. The combination of carbon fibre with joints produces mounts that are both easy to move and sturdy to use. MagConnect mounts come equipped with spherical joints for customizability. The included MagConnect iPad holder can be swivelled 360° to easily transition from portrait to landscape mode, without removing it from the mount. Its sturdy carbon fibre arms can also be adjusted into many different configurations, offering you an ergonomic angle every time. The MagConnect locking mechanism technology is user-friendly. It secures the iPad into a hard-shell case equipped with a powerful magnet. When the case is attached to a compatible product, another magnet instantly interlocks your MagConnect shell with a receiver, while a precision screw tightens for a secure fit.